Dogs brighten our lives and fill them with love and sweet puppy kisses. 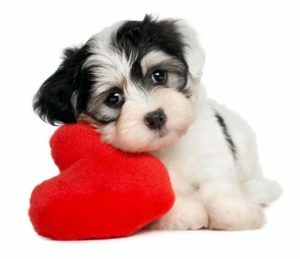 We give dogs affection in a million different ways, and they return that affection; it’s an affection so powerful it improves our health, our emotional well-being, and acts as a valid source of therapy when things are bad. Sometimes they show their affection with snuggles on the couch or an offer to play with a favorite toy. But their biggest show of affection usually comes in the form of a wet, sloppy face lick — puppy kisses. 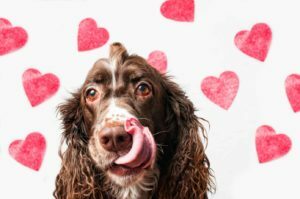 While puppy kisses are sweet, are they really safe for you and you dog? Dogs kiss us because they love us! Licking is one of their primary forms of affection. They also lick to communicate that they’re hungry, they need to go outside or they want your attention. Licking also is a way dogs comfort themselves; it releases endorphins, which makes them feel relaxed and happy. An anxious dog might be prone to licking to self-soothe, or compel his owner to provide reassurance and affection. A dog’s kiss is full of affection, loyalty and about 700 kinds of bacteria. Some of the less human-friendly bacteria include toxocara, pasteurella campylobacter and salmonella, not to mention parasites like hookworms and tapeworms and any other disgusting thing they might come across laying on the ground ookworm, tapeworm, and salmonella — not to mention anything they find lying on the ground. That’s a lot of nasty stuff that can upset gastrointestinal systems (among other things), and can exacerbate pre-existing conditions, like IBS, GERD and Crohn’s disease. While a dog’s mouth is full of stuff that helps them heal, it’s also full of stuff that will send you straight to a doctor’s office. If your dog is unwell, the chances you will get sick increases. While having a dog can be good for the health of even the smallest humans (having a dog can help diminish respiratory illnesses in children) when it comes to puppy kisses, it’s better to play it safe. You can let your dog give you a kiss. Just keep them away from your mouth. Licks on cheeks or hands are generally OK, as skin absorption of bacteria is rare. To be safe, make sure to wash up afterwards! 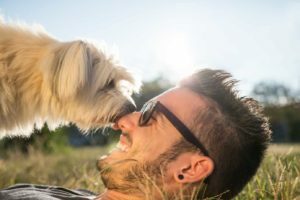 For anyone who is sick or who has a compromised immune system, including people who have HIV/AIDS, are receiving chemo or otherwise immunocompromised — it’s best to make sure you teach your dog to show affection in other ways. The elderly, as well as infants, should probably also skip puppy kisses. If the health risks are too great, you can teach your dog other ways to communicate. 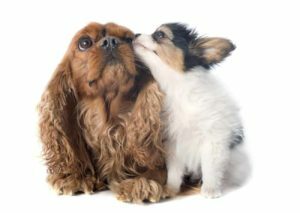 To break an unwanted kissing habit, show your dog that kisses or licks are not an effective method of communication. If your dog licks you, say no firmly and then leave the room. If you’re doing something your dog likes, such as petting and she starts licking, stop. Be consistent. Once your dog learns to link your absence with licking or understands you won’t do something she enjoys if she licks, the licking will stop.